World Water Day is held annually on 22 March and sheds a light on the importance of water, advocating for the sustainable management of freshwater resources. World Water Day is coordinated by UN Water and sets for each year the Sustainability Development Goal. 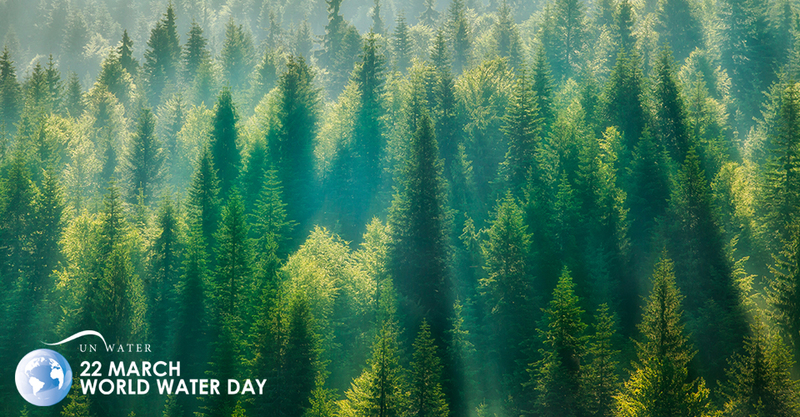 The theme of this year’s World Water Day, which marks 25 years since it’s been celebrated is “Nature for Water” focuses on nature-based solutions for the water challenges we currently face. Today 2.1 billion people lack safe drinking water due to damaged ecosystems which affect the quality and quantity of drinking water. Furthermore, it’s predicted that by the end of 2050 the water global demand will increase by 30%. When it comes to climate and environment issues, at least 65% of forested land is degraded putting at risk by 1.6 billion people from floods. By using solutions we already find in nature we can reduce floods, droughts and water pollution. Nature-based solutions such as reconnecting rivers to floodplains, restoring wetlands and reforestation are an effective way to improve the world’s water crisis and can also reduce the effects of climate change and improve human health and livelihoods. These solutions may not be the only way to end the world water crisis, but they offer cost-effective and innovative ways to improve the water infrastructure. Conservation agriculture, which protects soil from erosion can also reduce pollution from agriculture. In order to contribute to the conversations prompted by the World Water Day 2018, we want to bring to people’s attention the importance of caring for nature. Our company’s constant initiatives in close links with the local authorities are relevant steps in this direction. At AQUA Carpatica we value nature and we responsibly source our waters using state-of-art, environmentally friendly technology. We work directly with local authorities to enforce an environmental protection plan, ensuring that the land surrounding our springs is not influenced by any industrial activity or pollution. Deriving from two unique springs deep within the Carpathian Mountains- unspoiled by civilisation and untouched by agriculture and industry, humans do not interfere with or process the water, meaning that AQUA Carpatica is impeccably pure. The springs lie deep in forests of fir, pine and spruce trees, far from any human or industrial activity. Reigning over the Carpathian’s is the Bucovina region- a land defined by endless evergreens with thick undergrowth, the perfect hiding place for countless deer. It also offers refuge to the largest population of large carnivores in all of Europe – including wolves, brown bears and lynxes. It’s the last wild forest in Europe and hold the largest number of wild bears in Europe: 5000. We want to bring awareness to the water crisis, the importance of caring for nature and our conscious respect for the environment. Sustainability is an important step in preserving nature’s gifts, and AQUA Carpatica demonstrates that it’s possible to safeguard nature’s pristine beauty. You can also take action wherever you are on March 22 and make it about water!